You've probably seen this phrase floating around the Internet. It took hold in 2012 and introduced many people outside Japan to the word 先輩 (せんぱい), as well as its counterpart, 後輩 (こうはい). It became a popular meme, shortly after the word tsundere did the same. To most Japanese people, however, this "senpai sensation" was a surprise. To them, "senpai" doesn't necessarily carry any idolizing/romantic connotation. 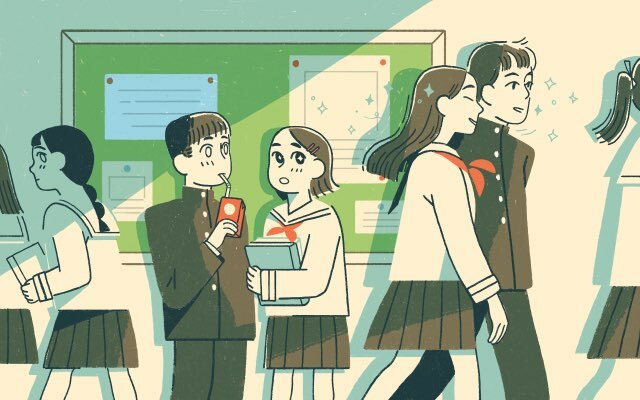 In fact, the senpai/kōhai relationship exists in almost all facets of Japanese life—far beyond the anime-high-school arena. In this article you'll learn the real meaning behind senpai and all the different ways to use it, taking into account its cultural and social underpinnings. And pay attention—if you visit or live in Japan, you may find yourself having a senpai… or a kōhai. Without reading this article, you may not know how to address them, or even be able to tell which one you are! Common and Fun Expressions Using "Senpai"
When you're learning new words in Japanese, it's always a good idea to study their kanji. When you look at 先輩 and 後輩, you'll notice they share the second kanji: 輩. "Previous mate" and "later mate." What do these words mean? 先輩 and 後輩 come as a pair: one can't exist without the other. As "previous" and "later" suggest, chronological order is a big part of what determines who is a 先輩 and who is a 後輩. Let's start by taking a look at how a dictionary defines them. A person who is in a higher position than you in terms of age, position, experience, or academic or practical skill. A person who is in a lower position than you in terms of age, status, experience, or academic or practical skill. Basically, 先輩 means a person who has more experience or a longer tenure in a certain field or organization. A 先輩 is often expected to mentor a 後輩, who is on the same path they were once on. In Japanese, whether you're a 先輩 or a 後輩 has a major impact on the levels of formality you use when speaking. It changes depending on your relationship with the person you're talking to. The 先輩/後輩 relationship is one of these: the definitions above are key to figuring out when a person is either your 先輩 or your 後輩. Language aside, there are certain unspoken expectations between 先輩 and 後輩, such as knowing when to speak (and when not to) in a meeting, and who should do clean-up at kendo club. As I'm sure you can tell by now, hierarchy is a big part of Japanese culture, and it's important to know about 先輩/後輩 relationships and to recognize them, especially where you're in those relationships! And the most important place to be aware of 先輩/後輩 status is at school. For a child growing up in Japan, school is the most common place to use 先輩/後輩, and the definitions above fit the world of academia quite nicely: the older students have joined the school before the younger ones. But the idea of "older" isn't based solely on age, and there are exceptions to "joining before" such as transfer students. 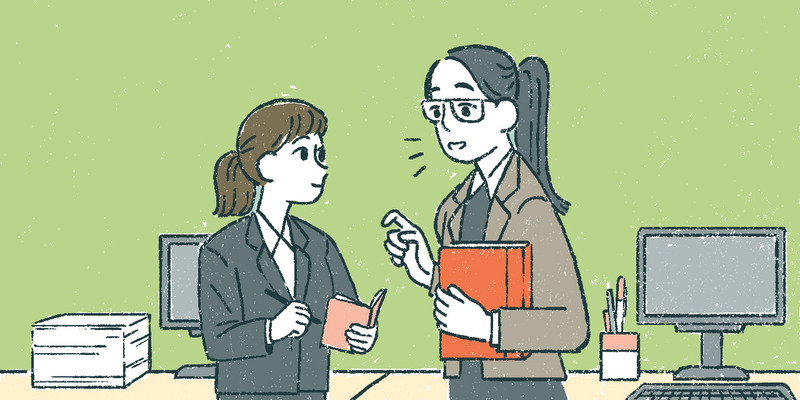 Japan's compulsory education is nine years—from elementary to junior high school. During this period, students are rarely held back and never skip ahead, so all the students in a certain year of school are considered the same age. For example, an elementary school first-grader is six years old at the beginning of the school year and turns seven before it ends. This "age according to school year" is the key to understanding 先輩/後輩 relationships at school. Hayaumare means people whose birthday is between January first and April first; osoumare is everyone else. Let me explain. In Japan, the first of April is the beginning of the academic year. Japanese law counts your age at midnight of the previous day of your actual birthday. So if you were born on April first, then the law counts you as turning six years old on March thirty-first, and you can enter first grade. If you were born April second, however, then you turned six on April first, and you have to wait until April first of the next year to start. A child born on April first would be the youngest in school, and a kid born on April second would be the oldest. Are you following me? My birthday is in mid-March, so I was younger than most of my classmates. Even though there was nearly a one-year gap between me and someone born April second of the previous year, we were considered the same age (同い年). Koichi-senpai is one school-year older than me, but he is hayaumare, so his birthday is actually only a week away from my birthday. March-borns like me are hayaumare—early born, even though we're the late ones in our school year. Hayaumare and osoumare were originally based on the calendar, when people counted their age based on the new year—January first. Okay, back to 先輩 and 後輩. Even though elementary school is where compulsory education starts, and is the first place children become part of school society, the terms 先輩 and 後輩 aren't common yet. I used to call my older friends by their name plus the name enders ちゃん or くん, but not 先輩. The same is true for older kids in the badminton group I belonged to in elementary school. It was a competitive club, but I still called older kids by their name + ちゃん/くん. Things changed dramatically when I got to junior high. After six years of elementary school, junior high felt more civilized. I was twelve, turning thirteen. Others made me feel that starting junior high was my entrance to adult society, and it turned out to be true. Things were different: I wore a school uniform for the first time, and started taking part in after-school clubs called bukatsu (部活). (More about bukatsu in a minute.) And it was where I encountered my first 先輩/後輩 relationships. I had a lot to learn! Here's an example. When I began junior high, my older sister instructed me to wear ugly white socks at first, rather than the more fashionable navy blue ones. The reason? 先輩 would have their eyes on me, she said, and might think I was arrogant if I was too stylish. As ridiculous as it sounds, at the entrance ceremony, almost every girl in my grade was wearing white socks, because they were all told the same thing! Now that I think about it, it was almost comical. But back then we were dead serious and scared of this new 先輩-filled world. It probably depends on the school, but in most cases this 先輩/後輩 tension appears for the first time in junior high school. Some 先輩 bully or harass the 後輩, so it was good that I was careful not to try to gain attention at first. And bukatsu is one of the main sources of tension at junior high school. Bukatsu is the name for after-school activities sanctioned by the school: baseball, tennis, band, art, science, the list goes on. You pick what you want to do from the options your school offers. Enjoying culture and sports with people who share your interests is the official goal of bukatsu, but it's also considered a place to learn etiquette and hierarchy through activities. During the school day, students usually stay in their homeroom with peers from the same grade. After school, because bukatsu is where you interact with students from different grades, it's also where you learn about 先輩 and 後輩. In junior high, I joined the badminton club. Many of the older kids were from my elementary school's badminton club, and when I spoke to them I did so the same way I always had—calling them by their name plus the name enders ~chan or ~kun. But because there were some senior students who had begun taking badminton in junior high, I had to call them 先輩 and use keigo (敬語, polite language) instead of tamego (タメ語, casual language). It didn't matter that I was better and more experienced at badminton. Before senpai come, kōhai in first grade have to clean the courts. My bukatsu didn't have a severe hierarchy. 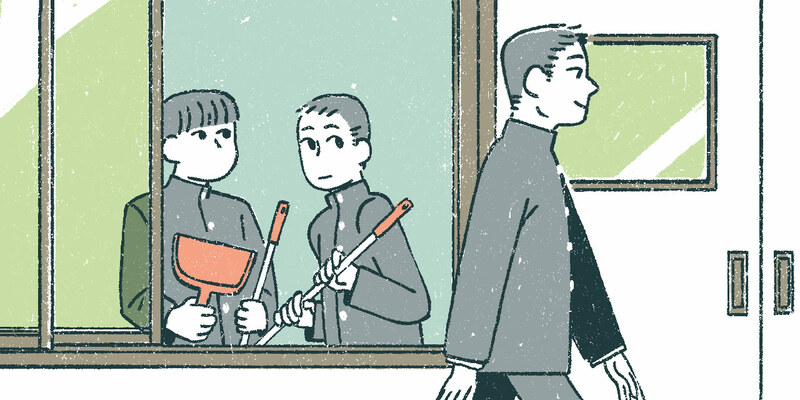 Some athletic bukatsu, however, have traditions and rules that require 後輩 to do chores such as cleaning and preparing for the next club meeting. The 先輩/後輩 relationship wasn't all bullying and chores. Having 先輩 was also fun! Even though 先輩 are only a year or two older because junior high and high school have only three grades, they seemed to me way more mature and sophisticated. I know it's because we were in the process of growing up, but that's the "senpai magic." Everyone was constantly talking and gossiping about 先輩. Some had secret (or not-so-secret) crushes on them, even though in 先輩's eyes, we were just the younger kids they didn't know or recognize. I find this ironic now because we tried so hard not to get attention in the beginning so we could avoid bullying! Anyway, this is the side of 先輩 that's featured in anime and manga, both inside and outside Japan. In terms of the 先輩/後輩 relationship, high school is similar to junior high. I went to a massive private high school and didn't join any bukatsu, so I don't have anything significant to mention about 先輩/後輩 from my high school experience. The only difference I can think of from junior high is that high school isn't compulsory and students can get held back, even though it's rare. Some of my friends studied abroad, and when they came back to Japan, they had to stay back while the rest of us moved on to the next grade. Some students might also repeat a school year if they have to take a break due to illness. I'm not sure if they would be able to integrate with younger students naturally, but many kids at this point aren't used to having older classmates, so I can imagine it being an interesting experience for both parties. They'd probably have a hard time figuring out the formality of the relationship—how to address them, how to speak to them, etc. In college, the age gap suddenly normalizes. You might find yourself attending classes with someone whose age is different than yours. Many students choose to become ronin (浪人), for example: slightly older students who, if they happen to fail university entrance exams right after high school, take time to study on their own (or at cram school) to get into a college they want to attend. In college, with students of various ages and more relaxed hierarchies in "circles," how do you determine the 先輩/後輩 relationship? A couple weeks after we met, one of my friends in college revealed she was a ronin. I remember it was quite shocking. But hers was a good decision, and in the end I didn't find it awkward because I had already begun talking to her in tamego/casual speech. I treated her like a friend. Similar to ronin, at most universities you'll find adult students who have come back to school after many years—they might take a long break to go backpacking or simply get held back by bad grades. In addition to varying ages, the 先輩/後輩 relationship set up by bukatsu continues into college with zemi (ゼミ) and kenkyūshitsu (研究室)—research groups supervised by professors in your major. And there's another addition too: colleges have a more casual form of club activity called "circle" (サークル). Circles are usually more relaxed, so the 後輩/先輩 relationship is less strict than in other group activities. To complicate things even more, some classes are electives where you could study with students from different school years. I have a kōhai who was a ronin for a year at my zemi, and that means she's actually our age, doesn't it? In college, with students of various ages and more relaxed hierarchies in "circles," how do you determine the 先輩/後輩 relationship? The year you enter college is the key. The actual school "grade," like freshman, sophomore, or junior, doesn't matter as much. I remember it felt awkward at first to have 先輩 classmates taking the same classes I did. It was a situation that would be impossible in junior high and high school. You can also refer to your school's alumni as 先輩/後輩, even if you didn't attend at the same time. I have a 先輩—a freelance announcer named Takigawa Christel who went to my university but graduated before I got there. Taking this a step further, you can even use 先輩 and 後輩 for public figures or celebrities. It's even common to refer to current students at the school you're applying to as 先輩, especially on application forms. Because I saw senpai enjoying school life, I decided that I wanted to go to Tofugu Gakuen. The 先輩/後輩 practice continues beyond school and into work, especially between young employees who haven't yet held a significant position. In the case of these young staff, they would not become 先輩 even when promoted, instead they would be jōshi (上司), meaning boss or supervisor, and their young friends who they supervise would become buka (部下). Becoming 先輩 in a work environment isn't cut and dried. Multiple factors determine someone's 先輩 status, including length of time in the workplace, age, job experience, skills, and more. Not all of these are required to be considered 先輩; they are just some of the factors. In Japan, job hunting is similar to school entrance exams. Companies advertise their job postings specifically to shinsotsu (新卒): new college graduates. After passing the exams and interviews that pit you against other candidates, you get the job—usually working alongside other shinsotsu. In my case, I was hired out of college along with four shinsotsu. Two were the same age as me, but one was a year older because she was a ronin, and the other was two years older because she had gone to grad school. But we were all dōgi (同期)—coworkers who joined the company at the same time. Our ages didn't matter. We had nine 先輩 who started a year before us, and two 後輩 who started a year after. Because some ronin-ed or went to grad school, they might have been older than someone who started at the job before them. In this case, age didn't really play a part in the 先輩/後輩 relationship. All that mattered was when they joined the company, and the extra work experience they had accrued during that time. Unlike interactions I had with 先輩 in school, I called them by their last name + さん or used their nicknames. The only time I would refer to them as 先輩 was when speaking about them to someone else. I also didn't use keigo with some of the 先輩. Maybe I'm a bad example of 後輩, but it all seems to depend on the company's culture—how conservative or casual it is, and the severity of the hierarchical relationships. My company was new and didn't follow the traditional promotion system, called nenkōjoretsu (年功序列). (In traditional nenkōjoretsu, employees are promoted based on their age and length of time at the company, rather than skill.) That might have accounted for the laid-back atmosphere at my first job. In Japan, job hunting is similar to school entrance exams. Companies advertise their job postings specifically to shinsotsu (新卒): new college graduates. It's pretty uncommon for people to switch jobs in Japan—some even work the same job their whole life. But things are changing, and now many people in Japan change jobs more often. That means there's a good possibility that someone who has more work experience in a certain field might join your company. This makes the 先輩/後輩 hierarchy complicated. In an established work environment, however, the words 先輩 and 後輩 aren't as important as they are in school, or even when you're first hired as shinsotsu. And even if it's unclear whether or not you should call someone 先輩, you can still use the term to explain who is 先輩 at the company from a certain perspective. The 先輩/後輩 relationship can apply to part-time or casual job situations (アルバイト) as well, especially when your workplace has no specific person who trains new employees. It's common for those who have been there longer to train new staff, which makes them seem more 先輩-like. Every company is different. Yet, your memories from high school might make you call older coworkers 先輩 regardless of their experience. Even though school and work are the most common 先輩/後輩 situations, some might use the words for other situations too. For other organizations, 先輩/後輩 are often defined based on how long you've been in the group. When I was searching for the words 先輩/後輩 on Twitter, I turned up a lot of conversations about celebrities from the same agency or the same idol group. Yoshimoto Kogyo, the largest agency for comedians in Japan, has a somewhat unique definition of 先輩/後輩. 先輩 is based on their career as a comedian. That's it. Even if someone transfers to their agency from some other one, if their career is longer, they're considered to be 先輩. Like I said, determining 先輩/後輩 company-wise is usually done case-by-case depending on its culture and traditions. As you can probably guess, this 先輩/後輩 model is often used for non-school/work organizations, like dojos, which rely on mentorship or hierarchical relationships for training. 先輩/後輩 can also be used for people from the same neighborhood or town, whether or not they attended the same school. Jimoto (地元), meaning "local" or "one's hometown," and age difference usually determine this type of 先輩/後輩 status. My close senpai from my hometown is expecting a baby soon. In my experience, people who cherish these kinds of local connections are often yankī (ヤンキー): people belonging to a certain youth subculture in Japan. Back in junior high, I often saw yankī kids hanging out in their usual spots—convenience store parking lots or public parks. They often skipped school, and few of them joined bukatsu club activities. As a result, they had a lot of time to hang out with other yankī from other schools, which may have fostered that kind of "hometown senpai" experience. 先輩 doesn't have to be tied to a specific group. You could call pretty much anyone 先輩 who has more experience than you in a certain field. It shows respect. Even if there isn't any social expectation to call them 先輩 or to have a hierarchical relationship, you can still 先輩 away! Outside of school or work, it depends largely on your judgment whether or not you refer to someone as 先輩, since in cases like these it's not socially required. So, be careful: if you use it when you don't really mean it, the word could be taken as sarcasm. Similarly, calling a less-experienced person 後輩 when you're not required to do so can be offensive, since it implies that you're superior to that person—based on your own judgment. The Japanese often use the term "senpai of life" (人生の先輩) for older people with more life experience. I respect Grandma as my senpai of life. Another usage of 先輩 I often hear is senpai mama (先輩ママ) or "senpai mom." Parenting is a new experience for most new parents, and for mothers in particular. A new mom might ask other women who have raised or are currently raising a child for their advice. A senpai mama is someone with more experience as a mother than you. That's a recipe that I learned from my senpai mom. You can use this kind of 先輩 for pretty much anything—even for someone who's been a fan of your favorite baseball team longer than you. As there are some senpai Hanshin Tigers fans with thirty years of experience, I'm still a newbie. Now that you've learned possible situations when 先輩 and 後輩 are used, along with their cultural and social background, it's time to introduce their use from a more linguistic perspective. In my club, there are eight senpai and two kōhai. If you're in second year, you could have both 先輩 and 後輩, because it's the middle of junior high and high school in Japan. Takigawa Christel is a senpai from my university. I joined the company earlier, but in terms of experience in the game industry, Michael is my senpai. Although it's not common to use 先輩 or 後輩 as first-person pronouns like "I," you can use 先輩 as a second-person pronoun—equivalent to "you" in English—when you want to refer directly to the person you're talking to. Do you like kale, senpai? Speaking of which, I watched the movie that senpai told me you liked the other day! The way a 先輩 addresses their 後輩 depends on each arrangement. Formally, the 先輩 would address their 後輩 with their name plus 君 or さん or even 呼び捨て (without an honorific). They're all good options. Like "he," "she," and "they" in English, 先輩 and 後輩 can also be used as third-person pronouns. Did you get a text from senpai? Senpai told us that first-year students have been coming in late too many times recently. Senpai will have an eye on you if you wear navy socks. Although you can use 先輩 as a name ender, you wouldn't use 後輩 as a name ender for the same reason you don't use it as a second-person pronoun. Although you can use 先輩 as a name ender, you wouldn't use 後輩 as a name ender for the same reason you don't use it as a second-person pronoun. I've never seen or heard someone calling their 後輩 name + 後輩. That would be really odd! But name + 先輩 is very common. Last name + 先輩 feels more formal, but depending on the 先輩 (how friendly they are or how they prefer to be addressed), first name + 先輩 or nickname + 先輩 works just as well. This same thinking could be used for when you're talking to the 先輩 in person and when you're referring to the specific 先輩 while talking to someone else. Has Tanaka-senpai gone home yet? Apparently, Suzuki-senpai's family runs a bacon factory. Seems like Fuguko-chan told Wanita-senpai that she likes him! 先輩 could also be used as an adjective. Japanese often makes use of terms like senpai mom (先輩ママ), senpai employee (先輩社員), and senpai staff (先輩スタッフ), all of which use 先輩 as an adjective. Based on the word after 先輩, you know what kind of 先輩 you're talking about and in what context they're considered your senior. Senpai staff were doing nothing but messing around; I couldn't focus on work at all. 後輩 isn't commonly used as an adjective like this, but it could be used this way depending on the context, especially in comparison with 先輩. Awesome...Thanks Famima senpai...(My battery was only 3%). The same phenomenon is happening to the word 先生 (せんせい). And while I used another Family Mart-related tweet for the 先生 article, please note that this isn't promotional! I'm not getting paid by Famima先輩—though it is true that it's my favorite convenience store! The use of 先輩 doesn't end with throwing the word around or attaching it to someone's name. You can also add some variety to your Japanese vocabulary by including it in other phrases and expressions. Akogare (憧れ) means ideal and 憧れの先輩 is a 先輩 you respect as a role model. In a love-relationship context, this could also imply you have a crush on this 先輩. What should I do to date a senpai that I have a crush on? Paisen (パイセン) is slang that switches 先 and 輩. Words reversed like this are called "industry terminology" (業界用語), which are certain words people in the media or advertising industry might use. A common example of this is to say "shi-su" instead of "sushi." It's a funny way of saying 先輩 and doesn't sound too serious. You could use this term with your friendly, fun-loving 先輩 or with friends when you want to praise them in a humorous way. Aya-paisen is just so great at drawing after all. 大 means "big" or "great" in Japanese, so daisenpai (大先輩) is your "great senpai": someone who is way older or significantly more experienced than you (or at whatever it is that makes them 先輩). Because you're emphasizing how great the person is, you could be showing huge respect. But at the same time, depending on the context, it could be taken as sarcastic. Donald is a dai-senpai—he's been frying potatoes for fifty years! It's really uncomfortable when someone blows senpai wind, isn't it? The Japanese beer brand Yonayona Ale even invented a fan that blows behind 先輩 when its AI detects 先輩-like pontification—a little hint for the 先輩 to pay attention to their unconscious 先輩 behavior! 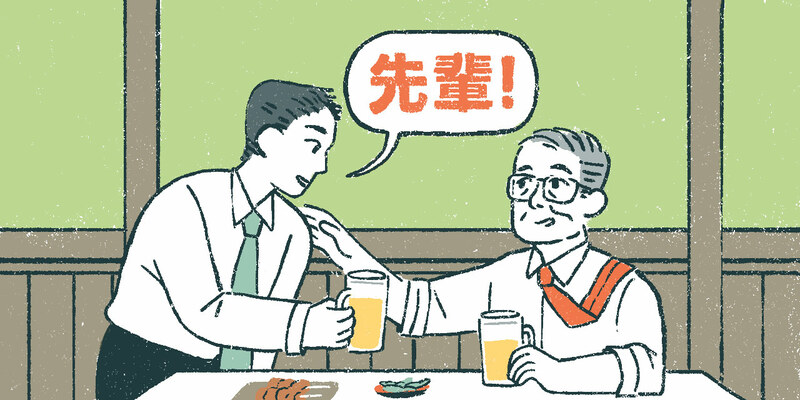 Especially in work environments, people's perspective on the 先輩/後輩 relationship is changing. Many have started questioning the idea that being older or having a longer career makes 先輩-like behavior socially acceptable. I gotta tell you: as someone with so much experience with Japanese culture, understanding the 先輩/後輩 relationship is an important concept, especially when you want to work with Japanese people. It's not easy to understand for everyone. Believe me, I was there at one point. I went through all that, and here I am, teaching you all about 先輩 and 後輩. I'm an expert! Either way, you now have a clearer idea of 先輩/後輩 and how to use (and understand) the words better than before! “同学年では遅い生まれなのに 「早生まれ」の理由.” NIKKEI STYLE. March 26, 2013. “吉本芸人のややこしい先輩後輩関係 年上が後輩も…” ライブドアニュース. September 7, 2014.
irashiさん. “先輩のことをいつから「パイセン」というようになったのか。” NAVER まとめ. January 23, 2015. 後藤香織 “「4月2日生まれ」で学年が変わるの？” CanCam. March 29, 2018.